Home » Will Trump start a war against Venezuela? Washington took another serious step to overthrow Nicolas Maduro. US Treasury Secretary Stephen Mnuchin announced sanctions against Venezuelan state oil company PDVSA. Americans are demanding that Maduro hand over control of the company to self-proclaimed President Juan Guaydo. Oil sales will continue, but proceeds from it will now flow into the pockets of those who are trying to complete the coup d'état. Given that oil accounts for 60% of state revenues and 90% of Venezuela’s exports, sanctions may increase public discontent, thereby bringing the end of Maduro closer. In addition to the tactics of economic strangulation, the White House keeps a power option in reserve. The notes in the notebook of national security adviser John Bolton were shown very pointedly. In the photos taken by journalists, the figure "6000" is visible. That is how many soldiers allegedly offered to send to Colombia. 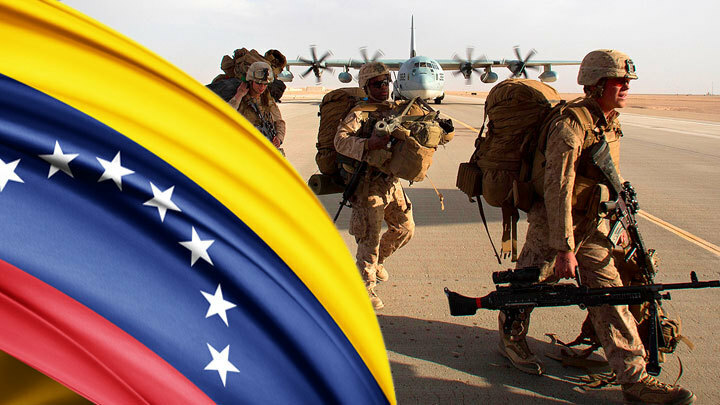 Although a refutation of the message about the dispatch of the US military appeared later, the fact of their discussion proves Trump’s thesis that the United States is “considering all options” of solving the Venezuelan issue. However, Venezuela has one of the most efficient armies in Latin America. Under Hugo Chavez and Nicholas Maduro, huge sums were spent on the army. Russia has also contributed to the modernization of the Venezuelan defense. It cannot be said that the Pentagon expects a “second Vietnam”, but there will definitely be no easy walk through the jungles of Venezuela to the American military. The United States since the 1989 invasion of Panama, did not resort to military methods in its "backyard". 30 years later, the situation may repeat, and there are domestic political reasons. Donald Trump is in a very difficult position. Although the Democrats agreed to temporarily cancel shutdown, they still refuse to allocate money to build a wall on the border with Mexico. So on the budget issue, Trump came out the loser. With the continuation of the interrogation of his advisers in connection with the "Russian investigation", the pressure on Trump will only grow. And in order to compensate for his failure inside the country, the head of the White House will seek victory in the outer contour. Venezuela is an ideal opportunity for this. A small victorious war could raise Trump's authority and postpone his imminent impeachment. As the Bolton note shows, the United States does not joke with the military operation. However, most likely, Trump will not hurry. His administration prefers to overthrow Maduro with less effort. Depriving Caracas of resources, Washington is counting on a split in the ranks of the Venezuelan army, where fermentation has already begun. And without the loyalty of the military, Maduro would not last a single day in power.